Present and protect rolled drawings. 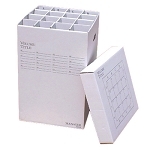 Perfect for the architect, engineer, artist, surveyor, draftsman, contractor or anyone handling drawings. Sturdy black nylon drawing protector that fastens automatically when rolled and becomes an integral part of the rolled drawing. Drawings are spring clipped to the PrintGard for easy viewing and handling. End flaps hold drawings open for easy view and handling. No need for rubber bands or other fasteners. Easy to carry and store in office or vehicle. Outside label for easy identification.